As we approach Sri Krishna Janamashtami midnight, many of us want to perform the Pooja of our beloved Kanha who is born on this pious night and receive maximum blessings. Ideally as we keep stressing many times at our website and articles too, that for doing a Prayer you do not need an auspicious time as long as you are wholeheartedly involved in it and do not perform it as a ritual but as something which is felt inside. Sri Krishna Janamasthami is certainly one such occasion when the sayer of the Bhagwat Gita was incarnated on Earth. There is a long and interested story associated with the difficulties his parents had to face but they are already very popular so we will not repeat them, though we do suggest for all Krishna Bhaktas to take a look at them at any website/book etc if they are not aware of them. 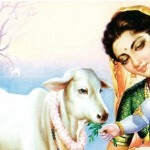 It is a good thing to keep fast on Janamasthami and considered to be very cleansing.